Sports columnist Jay Mariotti is well within his rights to resign from the Chicago Sun-Times, but he didn’t have to be a jerk about it. Jay is right that both the Sun-Times and Chicago Tribune are fighting to sustain circulation and sales. But Chicago needs its newspapers. And the less-celebrated (and less well compensated) people who work at them still need their jobs. Jay’s parting shot didn’t help the readers or employees who rely on the papers, because his comments may make it a little harder than it already is to sell enough ads and newspapers. After being a high-profile columnist at the Sun-Times for 17 years, Jay owed more than the back of his hand to a newspaper that put him in the professional and financial position to stalk off in a huff. If he had any manners, Jay would know that a graceful departure pays more dividends over time than acting like a jerk. But he doesn’t. So he did. U.S. publishers could boost revenues and improve the competitiveness of their newspapers by investing in modern production facilities, says Peter Klaue. He is the founder of Peter Klaue Media Consultancy in Hamburg, Germany, which provides strategic consulting and M&A advisory services for the publishing industry. One of the reasons U.S. newspapers are in a significantly worse spot than publishers in Europe appears to be that they failed to modernize their plants to improve their ability to print color and produce targeted local sections. While most American newspapers operate plants that are 15 to 20 years old –the production equipment typically is half as old at publishing companies in Austria, Germany, the Netherlands, Scandinavia or Switzerland. State-of-the-art equipment not only enables full-color capabilities but also considerably trims production costs by enhancing running efficiency. Limited color capacity in the U.S. not only makes newspapers less compelling to readers but also is a major negative factor for advertisers. First, black-and-white advertising is not as captivating to readers as those printed in full color. Second, and perhaps most important, is that most U.S. newspapers continue charging advertisers huge premiums for the relatively limited number of color positions available in their pages. Publishers justify the higher rates by saying it costs more to print color on their outmoded presses – as if customers were responsible for the industry’s lack of investment, instead of the other way around. With the charge for a color ad in a U.S. paper often three or four times the cost of a black-and-white spot of the same size, American papers are challenging advertisers to spend money with them, instead of encouraging them to do so. By contrast, papers in Europe take advantage of their modern plants to make color so widely available that color ads are far more common than black-only ones. Because color is routinely available in Europe, newspapers typically don’t charge extra for color advertising but, rather, charge all advertisers the same rate. And that rate is considerably higher than the average rate charged in the United States. The 15 largest newspapers published in Switzerland charge an average of US$42.90 per thousand readers, as compared with CPMs ranging from US$19 to US$25 in the United States. Thus, Dutch, German, Scandinavian or Swiss papers on average generate between 1.5 and 2 times more revenue per ad than their American counterparts. Modern equipment also makes it possible to efficiently print the paper in more sections. Where the typical European paper is printed in four or five sections (including at least one highly targeted local section), many U.S. publishers actually reduce the number of sections in their papers to shave paper costs and compensate for the inefficiency of their aged production lines. At a time most commentators and publishers agree that local news is a top priority for U.S. papers, the trend toward eliminating sections is going in the wrong direction. Local sections are not only popular with readers but also represent a major source of potential advertising. When outdated equipment makes it too expensive or all but impossible to print and distribute targeted local sections, newspapers lose a major opportunity. Although U.S. papers are suffering through the worst revenue and profit declines in their long history, they may want consider reinvesting in their press facilities before it is too late. One of the most successful publishers in the world has done just that. Rupert Murdoch invested nearly US$1.2 billion in new plants in the UK to significantly increase color capacity and output. Where such investments are out of reach, publishers need to get together to thrive: News International’s plant in Broxbourne, UK, prints Telegraph Media Group’s flagship publication. Sweden’s V-TAB prints papers for half of the newsstand racks, in a country which, by size and density of population, offers challenges in distribution comparable to those in rural U.S. states. Recent decisions in the U.S. heading in that direction include plans to outsource printing of the Boston Herald, Washington Times and Idaho Statesman. The San Francisco Chronicle has contracted with a commercial printing company to build a new plant and take over production, while its sister paper, the Albany (NY) Times-Union is building its own new plant. Some publishers may argue that it already is too late to turn around their papers and will elect, unfortunately, to squeeze what’s left from their businesses and then liquidate them. However, those who have not given up might take a close look at the newspapers that are seeking to consolidate printing operations in order to reduce costs while sharing the costs of modernizing their plants. Such decisions will not come easily in the “squeeze and cut” mode that has gripped the U.S. newspaper industry. But this may be the time for publishers to take bold action. Barack Obama’s veep text blast is not only the greatest advance in political public relations since the fireside chat but also a more important wake-up call for the mainstream media than the one many reporters got at 3 a.m. Saturday. Just as Franklin Delano Roosevelt bypassed the press by directly addressing citizens over the radio, the savvy Obama media team has developed a direct connection to the cell phones and email boxes of millions of Americans. “His opt-in e-mail list is 10 million large…and now he’s probably got a million cell phones,” Republican consultant David All told the San Francisco Chronicle. The email blast announcing the selection of running mate Joe Biden didn’t come off without several hitches. The campaign’s timing for the announcement was blown by the ABC News story late Friday night that the Secret Service had been dispatched to guard Biden. The first of the promised email alerts went out at the rude hour of 3 a.m. Saturday in the East. And many of us who signed up for the mobile-phone bulletin never got one at all. Glitches aside, Obama’s high-tech, word-of-mouth network – which includes the elaborate social-networking features at a website designed in part by a former Facebook executive – is credited for much of his success in the caucus states, where heavy volunteer turnout was crucial. The well-wired campaign probably is a major reason why the number of primary voters under the age of 30 nearly doubled in the 2008 primaries vs. those in 2000. Seventeen percent of under-30 voters cast ballots in this year’s primaries, as compared with 9% of the age group that voted eight years ago, according to the Center for Information and Research on Civic Learning and Engagement at Tufts University. Obama’s private network could be a major benefit to him in the general election. While 58% of the eligible U.S. population voted in the 2004 presidential election, fewer than 42% of those under 24 bothered to cast ballots, according to the Census Bureau. If Obama can use his network to lift the turnout in November among the younger voters who typically are glued to their mobile phones and the web, it could be just the edge he needs to put together a winning margin. What does this mean for the MSM? Quite a bit. The ability of a candidate (or other news maker) to route around the media further challenges the already tottering relevance of newspapers and television broadcasters, who are capable of delivering breaking news only within certain production- constrained timeframes. Word of Biden’s selection came too late for the evening network newscasts, many late local TV news shows and the deadlines of several East Coast newspapers. While all the media were able to catch up with the story on their websites, a paper like the Wall Street Journal had no VP story on its front page; papers like the New York Times had to run weasel-worded articles about how it might be Biden or someone else, and papers like Newsday and the Cleveland Plain Dealer urged readers to visit their websites to get the latest news. With all due credit to ABC for the late-night Biden scoop, its inability to do much with the story demonstrates how lame the mainstream media can look in a situation like this. :: Scoops whose release they can control, such as in-house investigations and enterprise projects. :: Analytic and interpretive pieces that go beyond the breathless, often mindless bulletins that clog cable news and the web. 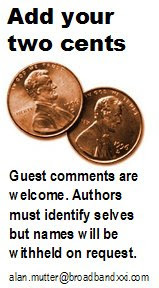 :: Hosting and moderating forums for vigorous debate on the issues of the day by proactively soliciting comments from both subject-matter experts and ordinary folks. The other big lesson for media is that they shouldn’t let Obama be the only one with fat lists of email addresses and mobile numbers. The traditional media need to invest in their own electronic-alert systems (and compelling products to utilize and monetize them). They also need to learn to actively promote their stories on Digg, Twitter, Facebook, YouTube and all the other places that a growing number of people look for news. If the MSM sit back and wait for readers and viewers to come to them, they are going to be mighty lonely. GateHouse Media was warned late today that it must come up with a plan to raise the price of its stock or will be dropped from trading at the New York Stock Exchange. If GHS is kicked off the Big Board, it would become the third newspaper publisher this year to be delisted at the exchange. Journal Register Co. (JRCO) and Sun-Times Media Group (SUTM) previously withdrew from trading at the Big Board when the value of their shares, like those of GateHouse, fell below the required minimum. A fourth newspaper publisher, American Community Newspapers (ACN) has been warned that it may be kicked off the Amerian Stock Exchange unless it quickly files the quarterly financia statement required under exhcnage rules. The NYSE requires a company like GateHouse to maintain a market capitalization of no less than $75 million and an average closing price of $1 per share in any 30-day period. On Aug. 15, the Big Board said that the average market cap for GHS was $57.3 million and the average share price was 99 cents. At the close of trading today, the value of the company’s stock was $34.9 million, or 60 cents per share. In a filing with the Securities and Exchange Commission today, the Big Board gave GHS 45 days to submit a plan to lift the value of its shares. If the company fails to produce a plan or the exchange declines to accept it, the company would be dropped from trading. If GHS departs the Big Board, its shares would join those of JRCO and SUTM on the Pink Sheets, an electronic marketplace accessible via any stockbroker. With newshole shrinking, one way to get more content in newspapers would be to bring back the streamlined spelling that was championed for 40 years by the Chicago Tribune until an un-foresighted editor scuttled it in 1974. A thoro account of the elaborate, four-decade effort is contained in a monograf published in 1988 by Prof. John Burke Shipley of the University of Illinois in, where else?, the Journal of the Simplified Spelling Society. The Colonel’s challenge was taken up with considerable zeal, and, before long, Tribune readers were treated to such creative spellings as distaf, hammoc, jocky, advertisment, catalog, skilful, derth, iland and many more. While many of the goofiest constructs were jettisoned over the years, the Tribune used “altho” thru the day in 1974 that then-editor Clayton Kirkpatrick finally put a stop to it all. At the time, it seemed to make sense. But today, in the era of twitting and txting, streamlined spelling could help papers pack more news in their columns while enhancing their appeal to the young people they covet as future patrons. Mebbe nwsprs shd tke a Q frm Col M’Crmk & use l33t sp34k 2 sav spce. The fourth publisher since 2000 could be the charm for the Los Angeles Times. Eddy Hartenstein has a shot at success, because, unlike his three predecessors, he has the decided advantage of not being a newspaper guy. Accordingly, he is under no professional or personal obligation to preserve, protect and defend his track record or the practices of an industry whose business model has not changed materially since Benjamin Franklin was a lad. 1. Listen to advertisers and non-advertisers, not your sales staff. The overwhelming impulse throughout the newspaper industry is to do everything possible to keep the business in 2008 as much as possible like it was in 2000. It would be nice if newspapers could do so. But let’s get real. Many retail, auto, recruitment and real estate advertisers in the last eight years have lost faith in the print advertising that accounts for some 90% of newspaper sales. They won’t come back when the economy rebounds. But advertisers still need customers and still want to improve their market share. The Times can be a powerful partner for them, owing to its widely known brand, its unparalleled content-generation capabilities and the millions of print and online impressions that it delivers every week. If Eddy spends time talking with his customers (and non-customers) to learn what they need, he will have an abundance of resources at his command to create the new print and online products that advertisers want. 2. Listen to readers and non-readers, not journalists. With all due respect to the newspaper’s distinguished news staff, most reporters and editors have lost touch with what modern readers – and non-readers – want. If they could bring themselves to having sincere, open-minded and no-holds-barred discussions with the consumers (and non-consumers) of their product, this talented group could respond by producing any number of innovative print and interactive products. But most journalists are wedded to preserving the “Father Knows Best” approach to journalism, wherein they decide what is important; they do the reporting and writing, and they decide what the reader gets to read and when she gets to read it. One-way journalism doesn’t fly with most younger readers – and it is barely clearing the runway with older ones, either. People increasingly are accustomed to picking and choosing what they read, hear and watch. If they don’t like the available media, they are ready, willing and able to make their own. To reassert its relevance in the busy lives of its readers (and to attract non-readers), the Times needs to stop trying to emulate the New York Times or Washington Post and concentrate on becoming a top-notch regional publication that runs shorter, tauter, more analytical and more forward-looking stories. Editors should take the path of least resistance in relaying information, too, meaning that sometimes a graphic, original document or a page of data will be a better way to tell a story than a 1,000-word yarn. The website is too important to remain a largely static repository for articles published in the prior day’s newspaper. The site needs to become an organic, dynamic and interactive mirror of the community. Journalists need to come down from their ivory towers to encourage, moderate and, when appropriate, supplement online reader comments on major stories. In other words, journalists need to engage their audience, not lecture it. And, yes, editors need to help the advertising department develop the new features and products that will help stabilize and grow revenues. 3. Stop playing defense. Try new stuff. Newspapers are a lot like factories filled with big, red buttons that any worker can punch to stop the assembly line in an emergency. In an age of shriveling revenues and shrinking payrolls, those buttons are getting pushed all too often by the functionaries at publishing companies who don’t understand how to respond to the new market realities, are afraid to change and understandably are terrified of their losing jobs. Eddy can’t rely on information and advice from people operating out of ignorance, self-interest and fear. And he can’t let them slow him down, either. In introducing himself to the staff this week, Eddy said he likes to manage by walking around and promised to "talk to any existing, new or prospective advertiser," according to an account in the Times. It sounds as though he is off to a good start. But he had better watch out for those big, red buttons. With a growing number of newspapers on the market at a time they most likely will fetch historically low prices, somebody is going to start buying some of them. But don’t count on the usual suspects. Start thinking, instead, about such unconventional potential purchasers as the multibillion-dollar investment funds created by countries like Singapore or the sheikhdoms of the United Arab Emirates. For considerably less than $1 billion of the up to $800 billion in its coffers, the Abu Dhabi Investment Council could buy the Newark Star-Ledger, Chicago Sun-Times and San Diego Union and turn them into U.S. editions of The National, the new English-language paper launched in the spring by the state-owned Abu Dhabi Media Co. In addition to grabbing major publishing platforms with convenient access to three of the nation’s largest and most influential population centers, the oil-rich emirate, which is one of the seven states comprising the UAE, also might consider buying the Austin American-Statesman to gain a major voice in the capital of the state that, with all due respect to Alaska, is the hub of the American petroleum business. Once established in three or four major U.S. markets, The Nation could expand publication to other cities in the same way USA Today, the New York Times and Wall Street Journal publish via satellite printing plants. Alternatively, Abu Dhabi could continue publishing the newspapers under their existing names, supplementing the indigenous coverage with articles and editorials from The National. Or, it could do both. Why would Abu Dhabi want to buy a bunch of American papers? The emirate, like several other wealthy world powers, is eager to diversify its national treasure in a broad array of industries in a variety of countries. Owning a group of widely disseminated publications in the United States would give the emirate the extra dividend of a powerful platform for asserting political and commercial influence. The investment would leverage the considerable start-up and ongoing costs associated with operating The National, whose staff of 200 journalists is headed by a former editor of the UK’s Guardian. Any subsidies from the sheikhdom required to transition the U.S. papers to the interactive era could be written off as the modest price of protecting Abu Dhabi’s interests and projecting its perspective in key U.S. power centers. In both motive and means, Abu Dhabi is far from alone. While Abu Dhabi has been investing in enterprises like Citigroup and the Carlyle Group, its neighbor Dubai, which has up to $80 billion to spend, has been buying into such American icons as Barney’s of New York, the Chrysler Building, MGM Mirage and Nasdaq. One deal that got away from Dubai was its effort in 2006 to buy the company that runs several major American ports. Though the transaction originally was supported by the Bush administration, the deal derailed when U.S. opponents argued that foreign management of the ports could pose a national security risk. Had Dubai or one of its neighbors owned a chain of U.S. papers at the time, would the outcome have been different? Abu Dhabi is not the only sheikhdom in the UAE that has created media aimed at influencing the English-speaking world. Qatar, whose sovereign fund contains up to $60 billion in assets, launched an English version of its Al Jazeera satellite-delivered news channel on July 4, 2005. But Al Jazeera has been unable to build audience in the United States, because only a handful of cable- and satellite-TV companies have been willing to carry the channel. Qatar would be even more frustrated if it had tried to get into over-the-air television or radio broadcasting, because the U.S. government limits foreign ownership of broadcast licenses to 20% of the entity controlling the license. Because no such rules govern the print media, there would be no obstacle to a foreign company buying as many newspapers as it liked in the United States. 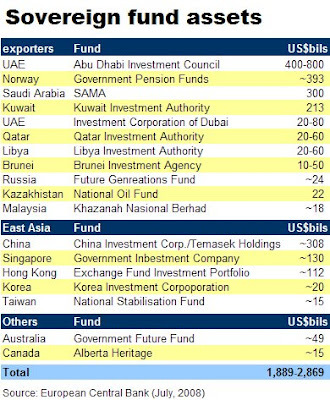 Beyond the UAE, several of the other countries operating sovereign funds also might find it commercially or politically useful to build a publishing presence in the United States. In but one example, a chain of newspapers would be a comfortable fit for Singapore, whose Singapore Press Holdings is “licensed” by the government to publish the English-language Straits Times, as well as 13 other newspapers and 100 magazines. Singapore Press Holdings is one of the most profitable publishers in the world, generating a 54% pretax profit in 2007, though its margins would be difficult to duplicate in the more open and competitive U.S. marketplace. Like the other sovereign funds, Singapore, whose $130 billion endowment is second in size only to China’s in Asia, has been diversifying in many industries in many places. It has bought stakes in Barclays, China Eastern Airlines and Myer of Melbourne, an Australian retailer. In the United States, it has invested in both Merrill Lynch and its headquarters building, the Merrill Lynch Centre. If Singapore intends to heavy up on U.S. assets, it might find it useful to have the power of some friendly newspapers behind it. The precedent for political- or ideologically-oriented ownership already exists at the Washington Times, which was found in 1982 by Rev. Sun Myung Moon of the Unification Church as a conservative counterpoint to the prevailing media. Multiple press accounts over the years state that the church has put the better part of $2 billion into subsidizing the paper. Sovereign funds and other non-traditional acquirers come to mind as potential purchasers of American newspapers because most of the conventional buyers seem to be out of the running. Apart from Gannett, which has more than a half-billion dollars in cash and a conservative balance sheet that could accommodate the debt necessary to finance acquisitions, no other publicly traded American publisher appears to have the financial wherewithal or, frankly, the will to buy any more newspapers. With its stock trading near modern-day lows, Gannett would have a hard time convincing most of its investors that owning more newspapers would boost the value of their holdings. Apart from Hearst which recently bought the Connecticut Post to help its partner, MediaNews Group, to reduce its debt, such privately held publishers as Advance, Blethen, Copley, Cox, Landmark, MediaNews and Tribune are the ones doing the selling, not the buying. News Corp., the international multimedia powerhouse, has the capacity to buy U.S. papers. But the intended sale of the Ottaway division acquired in the Dow Jones purchase, which was abandoned when no buyers materialized, signals that Rupert Murdoch probably is interested only in trophy properties like the Wall Street Journal – not any of the more prosaic publications. While several western European newspaper publishers are faring better in the Internet age than their American counterparts, most are focused on developing new media in their home markets or expanding elsewhere in Europe. Notwithstanding the appeal of favorable foreign exchange rates, most European publishers would regard U.S. acquisitions as dangerous distractions from other, more promising initiatives like websites, mobile media and free dailies, according to several colleagues in Europe. "It's too late" to turn around American papers, one German publisher told Business Week. While financially oriented private-equity investors in the U.S. and abroad ordinarily would gravitate to newspapers as an appealing asset class priced at historic lows, many potential investors have been frightened off by the rapid distress encountered by the buyouts undertaken at the Minneapolis Star Tribune and Philadelphia Media Holdings. There always is a chance a wealthy individual or two will turn up to buy any or all of the newspapers that are on the block. Because newspapers nowadays are intrinsically questionable financial investments, the individuals buying them most likely would be doing so to express thier social, political or commercial points of view. In the event foreign funds, institutions like the Unification Church or agenda-packing individuals start buying newspapers, it will mark the end of the long era of corporate ownership that widely embraced just-the-facts ma’am journalism as a sound commercial strategy for appealing to the bradest number of readers and advertisers. A return to the vigorous partisanship that was common in the American press in the 18th and early-19th centuries might make for some lively reading. If our papers fall into the wrong hands, however, the consequences for our democracy could be calamitous. Sam Zell may have set some kind of record in the speed he was forced to write down a significant portion of the value of the Tribune Co. Barely six months after acquiring Tribune at a value of $13.2 billion, the company charged off $3.8 billion in newspaper assets, trimming 29% of the value of the enterprise the Zellistas took over in an employee stock ownership plan on Dec. 20, 2007. The writeoff, which is required by accounting rules, is forced by the sliding sales and profits of the newspaper division. In the six months Zell has helmed the company, newspaper sales fell $173.6 million from the first half of 2007, or 10.9%, and operating cash flow tumbled $92.4 million, or 32.5%. Gains in the sales and profitability of the broadcast units improved the performance of the company to the degree that its consolidated sales of $2.1 billion were down 6.2% from the prior year and the operating profit of $313.4 million was off by 8.2%. The writeoff, which was effective as of the end of June but announced in an earnings release issued today, means the company’s value has dropped $640,518,500 per month on Sam's watch – or some $20 million per day. Advertising at the emaciated newspaper has shriveled to historically low levels. Its staff has shrunken to a fifth of its former size. Its readership has fallen by almost half. The presses have been shipped out. The building is up for sale. Welcome to the San Mateo County Times, a once vigorous, locally owned, independent, community paper in northern California that was purchased in 1996 by MediaNews Group. Serving an area bracketed on the north by San Francisco and the south by Palo Alto, the Times became one of a cluster of 20 dailies owned by MediaNews that ranges from the tiny Ukiah Daily Journal to the once-formidable San Jose Mercury News. All of them have seen better days. The Times may portend the future for other American newspapers owned by one of the several publishing companies that aggressively over-borrowed in recent years to fund acquisitions as the industry slid into an era of declining sales, slumping readership and uncontrollably rising expenses. The other companies range from such chains as Tribune and GateHouse to the one-off companies operating the Minneapolis Star Tribune and Philadelphia Inquirer. The managers and investors of these companies may yet see their initiatives pay off, though the prospects dim with every month of weakening sales. The MediaNews papers in northern California are unique unto themselves. They are not only the largest consolidation of newspapers in the country but also are being managed more aggressively than any other group of publications to squeeze as much cash as possible out of a highly leveraged business facing some of the worst market conditions in the worst environment in more than 300 years of American newspapering. With MediaNews forced by a combination of choice and unfortunate circumstance to push its ideas about newspaper “optimization” to the ultimate level, the price has been steep for the people working at its properties in northern California – and the communities they are supposed to serve. How many other papers will share the fate of the San Mateo County Times? It’s impossible to predict. But one thing is certain: Most of what made the Times the Times is gone. The newspaper this summer was stripped to a staff of exactly two editors, four reporters, two photographers, one sports correspondent and a secretary. The team will be expected to produce compelling, or at least convincing, coverage for two dozen separate and highly individual jurisdictions inhabited by some 705,000 residents spread over 741 square miles. The 10-person staff is about a fifth of the 48 editorial employees who worked there when MediaNews bought the paper a dozen years ago. The Times is skinnier today than it was back then. Not only have its ad volume and physical heft declined, but its readership also has dropped by 42% to some 26k in daily circulation from about 40k at the time it changed hands. Thus, the paper’s penetration of the market has shrunk to barely 9.5% of the more than 266,000 households in the county. To try to turn the tide, the Times sells subscriptions to the daily and Sunday paper for a mere $20 for a whole year. Although motorists can see the newspaper’s building from Highway 101, the structure is abandoned and up for sale. Before the staff departed for a rental office, production was moved to a MediaNews plant across San Francisco Bay, the presses were shipped off and intruders began stripping the building of its valuable copper fittings, according to former editor John Bowman, who resigned in 2007. By the time the county historical society showed up to retrieve the leather-bound archives the Times had kept for years in a climate-controlled room, rodents had damaged the issues so badly that the volumes had to be destroyed. The climate controls had been turned off to save money. The Times as it exists today almost certainly was not what William Dean Singleton had in mind when his company, MediaNews, bought the paper. Dean’s forward-thinking idea back then was to acquire and consolidate neighboring newspapers in a geographic area, so he could enhance the value of the assets by eliminating redundancies to pare costs to boost profits. He also had plans to share content among papers to avoid having multiple correspondents covering the same story, but there were hopes that at least a portion of the savings would go toward doing some of stories that otherwise wouldn’t have gotten done. Dean succeeded in assembling a formidable footprint of publications that helped make his company the fourth-largest publisher of newspapers in the country. And there can be no doubt that he has cut staffing costs to all-time lows. But, as discussed in a moment, the hoped-for profits have eluded him. 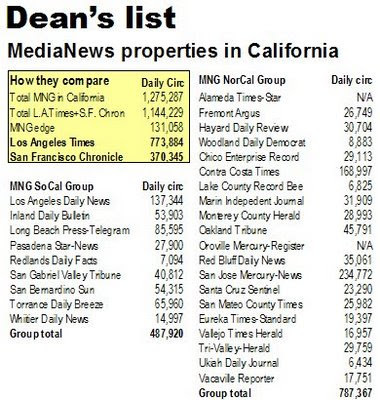 Dean’s greatest success, by far, was in building a game-changing cluster of newspapers in northern California. The combined daily circulation of the MediaNews properties in the region today is more than twice that of the San Francisco Chronicle, which once rightfully billed itself as the largest-selling newspaper in northern California. MediaNews reigns as the dominant newspaper publisher in the state, too. 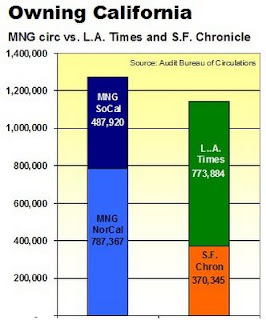 As you can see in the table below, the total circulation of its clusters in northern and southern California actually surpasses the combined circulations of the Los Angeles Times and the Chronicle. In addition to buying as many papers as fast as he could, Dean borrowed great sums of money at the peak of the credit binge. But his success has come back to bite him – and, potentially, his partners at Gannett, Stephens Media and Hearst, who helped finance the myriad acquisitions that built his California empire. Having borrowed heavily to cluster together California’s newspapers, MediaNews today is straining to keep up with the more than $1 billion in debt that it assumed in the belief it would be able to increase sales and trim expenses to produce ever-greater profits to pay off the loans. The debt is carried not just by the northern California papers but across an entire company composed of a complex series of partnerships owning 56 daily newspapers in 11 states. MediaNews does not break out information for individual publications or groups, but gave a glimpse at the state of its finances when it sold its Connecticut Post earlier this month to Hearst to repay almost 25% of its bank debt. This deal trimming a portion of its billion-dollar debt may forestall some of the drastic cuts that otherwise might have been required in the future to keep MediaNews ahead of its creditors. But the transacton is unlikley to reverse the cuts that already have taken place, because the heavily indebted company, like every other newspaper publisher, is fighting fierce economic headwinds. The problem for MediaNews and most other publishers is that sales and profits have been going down, instead of up. According to the MediaNews financial statement for the six months ended in December, 2007, its operating profits fell by nearly 25% from the prior year. The report proved to be its last public financial statement, because the private company has elected since then not to issue any more. Although MediaNews did achieve an operating profit of nearly 11% on sales of just under $680 million in the six months ended in December, the margin was well under the 14.9% earnings it generated in the same period of the prior year. As rocky as things were for MediaNews in 2007, things have gotten only worse for newspaper publishers since then. In its struggle to avoid default, MediaNews is battling not only rising expenses for newsprint (up 20% this year), gasoline (up 33% through May) and just about everything else but also advertising revenues that are falling faster than even Dean’s seasoned cost-cutters can cut. The desperation to make the numbers is so great that nothing is sacred. Publishers have been changed. Budgets have been revised. Editors have been ousted. Newshole has been squeezed. Ad makeup has been outsourced to India. Because newsrooms can be trimmed more readily than any other part of the operation, they have been hit the hardest. The staff of the Santa Cruz Sentinel was slimmed to almost nothing and the survivors were shipped to an office park outside of town. The newsroom of the San Jose Mercury News has been whacked in successive layoffs to a third of its strength in 2000. Even staff critics have been replaced by Associated Press movie reviews. Though the San Mateo County Times still carries a few staff-written stories about local events, the shrinking paper and its website are backfilled with news from MediaNews papers in other counties – including those located on the other side of the bay. With fewer staffers now than two months ago, local stories will be scarcer than ever. Because the change in coverage has occurred in a subtle fashion over an extended period of time, the executives at MediaNews evidently think readers won’t notice. With the default last month of Journal Register Co., the Default-O-Matic now shows Tribune Co. as the publisher most likely to be unable to repay its debt in the future. 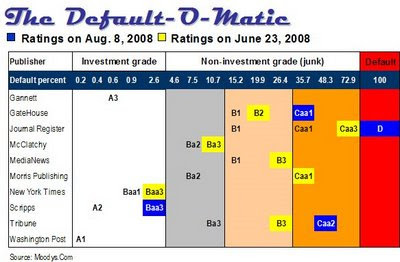 The Default-O-Matic predicts a company’s risk of default by using ratings from Moody’s Investors Service, one of the three independent agencies hired by bond issuers to assess their ability to repay the money they borrow. Since the Default-O-Matic was launched here six weeks ago, not only did JRCO hit the wall but the ratings of three of the nine remaining publishers were downgraded by Moody's. 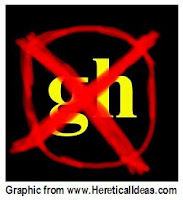 In addition to Tribune, the others taken down a few notches were GateHouse Media and Scripps. Journal Register on July 31 slid from the lowest-possible junk rating to the D category when it suspended payments on its $640 million in debt. In a complicated arrangement, JRCO’s lenders agreed to a holiday on interest payments until Oct. 31 in the hopes the company can reorganize or be sold. If something doesn’t happen by that date, there is no plan for the lenders to extend the so-called forbearance period. Given that the company has stopped paying cash interest and that its liabilities outweigh its assets, its condition is “tantamount to an event of default,” said Moody’s. With Journal Register effectively off the board, the publisher at the highest risk of default now is the Tribune, which owes some $12 billion and is among the most aggressively leveraged of all publishers. Just six months after being taken over in an high-risk financing engineered by Sam Zell, Tribune’s rating dropped two notches on June 23 into the lowest tier in the junk-bond category. At its new Caa2 rating, Tribune’s issues are considered to have a 48.3% chance of not being repaid in conformance with the terms of the borrowing. In announcing the rating reduction, Moody’s added that the outlook for Tribune is “negative,” signaling the possibility of future downgrades. The third publisher to be downgraded in the last six weeks was Scripps, which dropped three notches from its prior position after its interactive division was spun off on July 1. Despite the reduction, the company’s issues remain investment-grade securities with a comfortable 2.6% probability of default. Where’s the Edwards love-child story? National Enquirer scoop or not, there appears to be way too much smoke here for the major mainstream media to continue ignoring the story about the out-of-wedlock child that John Edwards may have fathered. With everyone from Drudge to Leno to Wonkette riffing on a tale that began trickling out at Christmas, the MSM look foolishly out of touch by continuing to remain silent about the allegation that Edwards fathered the girl recently born to a former campaign aide. This is a messy and unseemly matter that I wish never had seen the light of day. Now that it is festering on the web, on talk radio and around the watercooler, mainstream journalists owe their readers and viewers their best professional efforts to sort fact from innuendo. While only Edwards, the woman and their DNA lab know the truth at this point, the media at a minimum must assemble an accounting of what to date has been reported and what, if anything, has been corroborated, debunked or remains in question. Even though his presidential campaign is over, John Edwards has sought to be a major public figure for a decade. As such, he long since has forfeited any claim to privacy for his family or himself. In both of his campaigns for the White House, Edwards made his wife and family major centerpieces of his political narrative, often alluding to the tragic death of his teenage son and frequently using his two youngest children as campaign props. When it became known early in the 2008 primary that the talented and appealing Elizabeth Edwards was suffering from a potentially fatal recurrence of cancer, both the former vice presidential candidate and his courageous wife decided to press forward with his pursuit of the Democratic nomination. To their credit, the Charlotte Observer and Raleigh News and Observer are two of the few mainstream media outlets to have openly discussed the story. The papers, which share coverage, not only sought to quiz the former senator about the allegation but also turned up the birth certificate for the child in question, revealing in the process that no father was named. The rest of the mainstream media need to start writing and talking about the story, too. If not, their silence will be viewed as complicity in a suspected cover-up and their already fragile credibility will slip still further. If Edwards was fooling around on the side while putting his ailing wife and little kids through the rigors of a national campaign, his duplicity deserves to be exposed. If Edwards has been accused unfairly, then he needs to stop running from the media and clear things up. His recalcitrance has been fueling the story. Now, only his forthrightness can stop it. A common theme among newspapers “reinventing” themselves is that they intend to concentrate on local news, the strongest and most defensible part of their franchises. But are they really walking the walk? At a time when the demand for local news is at an all-time high, the Denver metros can't (or won't) take the steps necessary to report the news in their own backyards. And local news is the only thing they have to sell. I sure don't get my national or international news from the Post or the Rocky. I go online. But I can't get local news online. I define "local" news as the type we use to see in zone sections. Back in my newsroom days in the 1970s and ’80s (in Oklahoma City, Jacksonville, FL, and Denver), we used to produce two to eight zone sections twice a week with a couple of reporters and editor for each section. We filled them with all the stuff that readers were interested in but couldn't find anyplace else: births, deaths, divorces, marriages, anniversaries, engagements, school-lunch menus, school calendars, zoning hearings, local city council meetings and meetings of the subcommittees, school news, lots of prep sports, features and “business of the week” profiles. We crammed in as much as possible. It was all relevant to readers because it happened in their neighborhoods or suburbs. Zone sections were an invention of the ad departments, which were convinced that if you offered a small business an ad that didn't have to go ROP, they would buy in. It kind of worked and kind of didn't. Ad salesmen on commission didn't want to waste time selling small, cheap ads. The circulation departments were never smart enough to get the right section in the right zone. And newsrooms looked down their collective noses at anyone that worked on the “zones.” The sections fell into disfavor and disappeared – and all the good LOCAL stuff that readers wanted also disappeared. In the Denver metro area, there are 12 to 15 suburbs with a population of at least 40,000 people apiece. Both the Post and the Rocky do a horrible job of reporting anything that occurs outside of the city and county of Denver. The bulk of the local news report is filled with DENVER stories. Last I knew, the bulk of the Post's circulation is in the suburbs and not in Denver proper. To the credit of the Post and Rocky, they have tried some zoning (both print and Web) using “citizen” journalists, but the stories are what you’d expect: warm and fuzzy feature stories. I live in the Denver suburb of Lakewood, which is in Jefferson County. Jeffco has the largest school district in the state, but I can't tell you the last time the Post had a Jeffco school story. I can't tell you the last time the Post had a Lakewood story. Lakewood has a population of 150,000. Forty seven percent of the population is under 35 years old. Seventy five percent is under the age of 50. Great demographics. Why is there no coverage of Lakewood and our huge school district? You can pretty well apply the Lakewood example to any of the other Denver suburbs. So, if I don't get my national and international news from the Post, and the paper makes no attempt to cover anything about where I live and work, then why should I subscribe to a newspaper that is not relevant to my life? It gets worse. The Rocky Mountain News, the Post’s partner in the Denver joint-operating agency, pretty much hews to the same line as the Post in regard to what gets covered. I read the same stories in both newspapers. If I remember correctly, one of the bedrock principles of the JOA was to preserve diversity in the news reports. Ain't happening. I guess that the Post and the Rocky together have about 100 reporters and probably another 200 editors. Considering that number, it’s amazing they can't produce a newspaper that is relevant to my life or to the lives of any of my neighbors or friends. I'd hate to be a newspaper editor today, but if I were. . . Instead of spending time bemoaning how my owners are going to kill my paper, I'd make real sure that the people on my staff were covering news relevant to the communities where subscribers live. I'd fire a third of the editors and convert another third of them to being reporters and give them a laptop. I'd send all my reporters home with a laptop. I would tell each of them his beat is now a circle with a radius of 12 blocks and the center of the circle is his house. I want to know everything that happens within those 12 blocks. I don't want to see you in the newsroom, unless your editor or I summon you. I will count bylines. If you don't submit at least one story a day, I will be unhappy. If you go a week without a byline, you will be fired. I will expect you to know how to use a digital camera and I expect you to submit at least one picture a day from your circle. Because all the reporters and editors are college graduates and have been making a good living for a good number of years, they all live in upscale portions of the metro area, which will limit the news that gets reported. This is a good thing because it would give me the opportunity to hire blue-collar reporters that care about what goes on in their neighborhoods. They would be much more concerned about why their Johnny can't read and why his classroom has 39 kids, one teacher and no aide. Or why their street never gets swept, nor the snow removed. In short, we would start reporting news that is relevant to my readers. What do I do with all this news? Put it on my web site as a zone section. Will this save my newspaper? Don't know. But at least I will know I tried – unlike the gutless editors who have bailed out of their newspapers because they didn't want to make tough decisions. The intentions of Copley Press and Advance Publications to explore the sale of two of their signature properties represents a discouraging new lack of confidence in the future of metro newspapers. The potential sale of the San Diego Union-Tribune and Newark Star-Ledger at the worst time in the history of newspapering can mean only one thing: The publishers don’t think the business will get any better. If they did, they would slash expenses, hunker down and quietly prepare to sell their papers during the next rebound in the economy. With the publishers deciding, instead, to pursue potential exits at a time buyers are few and far between, the irresistible conclusion is that they foresee only a steady wasting of the assets they have held for multiple generations. Their willingness to consider dumping their papers at what most likely would be fire-sale prices amounts to a repudiation of the businesses that helped build their family fortunes. Because Copley and Advance do not appear to be under pressure to divest assets to raise cash to pay down debt, they would seem to be in a position to wait for a more propitious time to sell. Their lack of patience suggests a lack of confidence that better days lie ahead, at least with respect to these two properites. Unlike Journal Register, GateHouse Media and Tribune, these privately held publishers are not known to be over-burdened with debt they are struggling to repay at a time revenues are shrinking at double-digit rates. The Newark and San Diego papers have been held so long and historically appear to have been run so profitably that the initial investments in them have long since been paid off. The relative absence of debt also means that the private publishers aren’t committed to the rigid profit targets associated with the aggressive loans that funded recent acquisitions by MediaNews Group, Philadelphia Media Holdings and the Minneapolis Star Tribune. Presumably, the Newark and San Diego papers could be operated indefinitely with lower margins than companies like Gannett, Lee Enterprises or McClatchy need to pay dividends, cover interest payments and try to reverse Wall Street's unprecedentedly negative opinion of their stocks. Advance already has proven capable of subsidizing the Star-Ledger with the profits flowing from its magazine, cable television and other media enterprises. The parent company for some time has been funding losses in Newark that could be as great as $40 million a year, according to Donald Newhouse, the president of Advance. But the plan to explore the sale of the paper explicitly signifies that the controlling family is not only approaching the limit of its charity but also has lost faith in the possibility of an eventual turnaround. While the short list of potential buyers would seem short indeed, it is conceivable that the Newark paper could be of interest to Cablevision, the new owners of Newsday, whose Tri-State cable-TV interconnect coincides relatively closely with the paper’s footprint in New Jersey. A case could be made for consolidating the Star-Ledger’s operations with those of one or both of the New York Post or New York Daily News. This outcome would become more plausible if the dueling tabs move forward on their reported discussions about combining their printing, distribution and back-office activities. In better times, Newark would have been a candidate for combination with the Philadelphia newspapers, but the financial condition of that fragile, free-standing acquisition all but rules it out as a potential buyer for either the Star-Ledger or even its sister paper in Trenton. San Diego’s traditional strength has been its dominance over an isolated, usually booming city in a delightfully desirable corner of the world. The collapse of San Diego’s overbuilt housing market has carved a major hole in not only its classifieds business but also just about every other advertising category. The glorious isolation of the Union-Tribune will be a negative, however, when it comes to enticing any buyer who can achieve meaningful efficiencies by combining ad sales, content generation, production or distribution. Unlike the Star-Ledger, which has a decent of number nearby papers with which it could merge, the San Diego paper has no obvious potential partner in the neighboring vicinity. While it is difficult to think of Copley Press as a struggling entity, the company does not have the deep and diversified profit centers that companies like Advance or Hearst have tapped over the years to fund their struggling metros. Thanks to its magazine, broadcasting and other businesses, Hearst, like Advance, has been subsidizing for some years losses that exceed $1 million a week at the San Francisco Chronicle. The recent ouster of chief executive Victor F. Ganzi at Hearst may be a signal that yet another long-time newspaper family is running out of patience. If so, the Chronicle could become the next big-name paper to get kicked out of a well-feathered family's nest. Who will feed AP the news? Ironically, struggling newspapers and booming Google both count heavily on the same source for much of the news that fills their columns and populates their pixels: The Associated Press. But where does the AP get its news? Mostly, from the very newspapers that are trimming back their coverage as they shrink their staffs, according to a spot check of the stories moving on the AP wire last month. If newspaper staffs continue to erode, where will the AP and its clients get the news in the future? 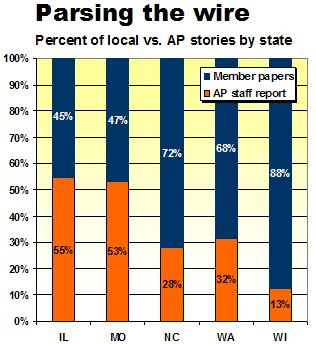 After counting the stories on five state wires on randomly selected days in July, I discovered that the AP itself generated an average of only 33% of the stories on its wire. The balance of the coverage came from – y0u guessed it – the member newspapers. And that’s a problem, because the newspapers the most part are reducing their staffs as they try to sustain their traditional profit margins in the face of historic declines in advertising sales. While I freely concede the results of this spot check are not definitive, it is the best information I could obtain, because the AP refused to disclose the actual numbers. “We’re done with that kind of story,” said Paul Colford, the former journalist who is the AP’s director of media relations. “This was asked and answered in the Wall Street Journal,” continued Paul, pointing to this article discussing the increasingly rancorous relationship between the AP and many of the 1,500 newspapers that own the news-gathering co-operative. But the article, while a terrific summary of the growing tension between the AP and many of its members, doesn’t in the least address the question of where the AP gets its news. I set out the answer the question with the help of friends at a few papers, who helped me count the number of AP-produced stories on their state wires on single, ordinary news days in July. Together, we discovered that there is quite a variance in the amount of original coverage supplied by the AP. The AP coverage ranged from as few as two staff-written stories in Wisconsin to eight articles in Missouri during the Anheuser-Busch takeover by InBev. The highest percentage of AP-produced stories (55%) occurred in Illinois. But the percentage is less impressive when you divide the state’s population by the number of stories produced by the AP. The wire service filed one story for every 1.2 million citizens of Illinois, as compared with one story for every 347,282 people in neighboring Wisconsin. In light of the above, it seems fair to hypothesize that AP, as structured today, won’t be in the position to pick up the slack as newspaper staffs are thinned. Many of the kinds of stories covered by individual newspapers today simply won’t see the light of day in the future. While the AP could solve this problem by putting more correspondents in more places, this is unlikely to occur, given the growing pressure from member newspapers urging the AP to cut its fees during a time of straitened economics for the industry. Far from trying to help the AP bolster its news-gathering resources, the editors of some member newspapers actually are going the other way. Displeasure with the cost and limitations of AP coverage has caused editors in Ohio and Montana to create alternative online exchanges to share stories and by-pass the 162-year-old news co-operative. “We could easily do what Ohio is doing and cut out the middleman,” said one editor participating in my mini-survey. “All the AP is doing is cutting and pasting off the member sites,” which it is well within its rights to do under the co-operative agreement it has with member news organizations. Even in states where editors have not gone so far as to create an alternative to the AP, they have reduced the amount of content they are willing to feed to the wire. Far from being a solution at a time of diminishing editorial voices, the AP may be another dimension of the problem.